One day rainwater systems will be a standard feature of building construction just like indoor plumbing. It begins with relearning what is necessary and normal. We no longer allow buildings without indoor plumbing and in the future it will be the same for rainwater systems. Today, many schools ranging from kindergarten to college are installing rainwater harvesting systems. These systems are designed to capture rain water from the roofs and then store the water for future use. This is happening in our local Santa Fe Public Schools; a great place for rainwater systems. Schools have large capture areas (i.e. large roof areas and parking lots) that make rainwater harvesting the envy of rainwater harvesters, plus there is a big need for irrigation water for landscape areas such as athletic fields, play areas and gardens. Local schools featuring rainwater systems include Santa Fe High and Salazar Elementary with 50,000 gallons of storage each, Atalaya Elementary with 25,000 gallons of storage as well as smaller systems at Amy Biehl Elementary (4 – 1,400 gallon tanks), and Tesuque Elementary (2 - 360 gallon tanks). The rainwater at these schools is conveyed off the roofs and other areas, filtered (i.e. often called pre-filtered as this first set of filters only removes the large debris) and then stored in either above or below-ground tanks. When the water is used for irrigating landscapes and gardens a pump is engaged, it is filtered again (i.e. small 200 micron filter to prevent clogging of irrigation heads) and sent to the hose or irrigation system. 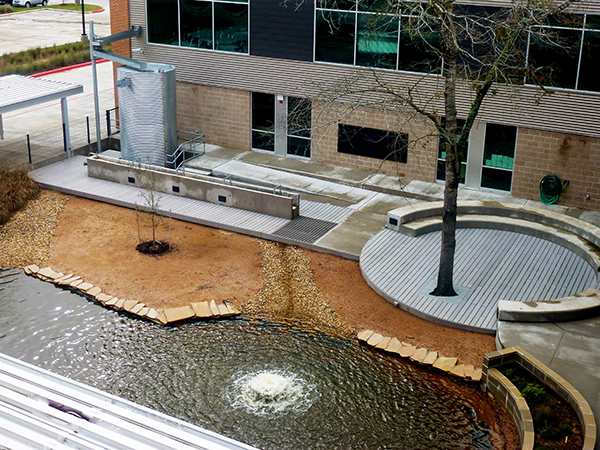 Thus rain water replaces potable water on these landscapes reducing operating costs. These rainwater harvesting systems reduce potable water use, decrease ongoing operating costs for our schools and prevent storm run-off that would negatively impact our environment. Another benefit of these systems is education. At Amy Biehl and Tesuque Elementary Schools the above ground tanks are a very visual reminder of the value of rain. At Santa Fe High, Salazar Elementary and Atalaya Elementary with below-ground tanks real-time monitoring systems have been installed that will enable students and faculty to view water storage and use. At the newest system at Atalaya Elementary the data will be available to students as well as the general public. The intent of these tracking systems is to know how much water is being saved. Per Lisa Randall, Energy and Water Conservation Program Coordinator for the Santa Fe Public Schools, “We are now actively monitoring our water use and consistently finding new ways to reduce our potable water use. From 2011 – 2014, the Santa Fe Public School District has reduced their water use by 43 percent, a reduction of over 20,000,000 gallons a year! This savings, about a 1 gallon per capita per day reduction for the Santa Fe area, has been the result of an active water management program that includes rainwater harvesting. Our schools, teachers and school staff heavily influence our future. They create an environment for learning and awareness, and influence how future generations will behave. Schools are anchors in our community. These facilities typically have very large footprints and therefore are great rainwater and solar harvesting opportunities. It is highly appropriate they serve as a role model for the community of what the future will look like. Conserving precious water is a job that belongs to all of us. The Santa Fe Public School District is doing its part to move us to a more sustainable future. Related Article: Water: Why Care?